A Murosky family photograph most likely taken in late spring or summer of 1944. 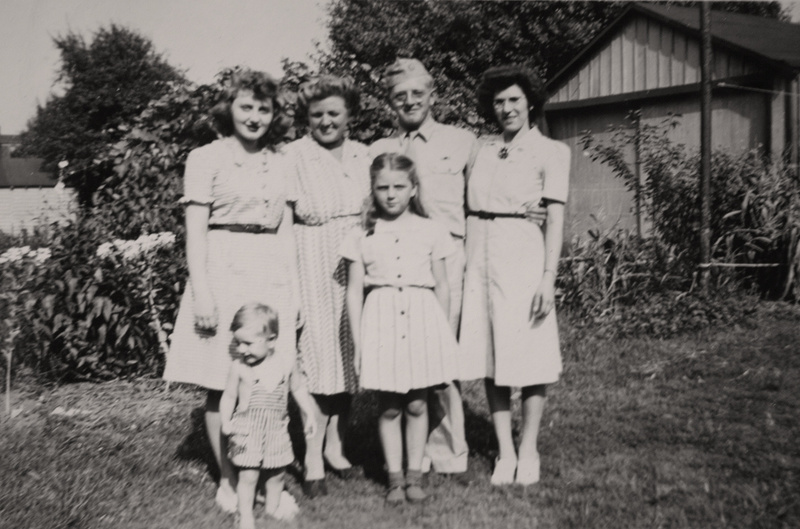 The family most likely gathered in 1944 to spend time with Harry Anthony Murosky who would have been on temporary leave from the Army Air Forces. Harry enlisted in the United States Army on 1 October 1942 in Erie, Erie County, Pennsylvania. He was discharged from service on 13 March 1946 at Fort Dix in Burlington County, New Jersey. Harry, age 23, was photographed with his younger sisters Rita Ann, age 17, and Marian Elaine, age 9. Their mother Helen Tillie Bukowski, age 43, was also in the photograph. Harry's nephew James Arthur Murosky, between 20 and 22 months old, the son of Harry's brother Arthur was also in the photograph. James Arthur Murosky was the first grandchild of Helen Tillie Bukowski and Anthony Harry Murosky, Jr. This visit may have been the first opportunity Harry had to meet his nephew who was born shortly after Harry enlisted in the Army. To view an individual photograph of James Arthur Murky taken the same day see the post 1944 - James Arthur Murosky. The photograph also includes an unknown woman on the right side of Harry. Helen Tillie Bukowski is my Great Grandmother. Harry Anthony is my Great Uncle. Rita Ann and Marian Elaine Mursoky are my Great Aunts. Their sibling Arthur Murosky is my paternal Grandfather. James Arthur Murosky is my Uncle. National Archives and Records Administration. U.S. World War II Army Enlistment Records, 1938-1946 [database on-line]. Provo, UT, USA: Ancestry.com Operations Inc, 2005. Record for Harry A. Murosky.